We are a network of people who share a common philosophy in relation to singing and groupwork. Most members are based in the UK but we have a steadily growing international membership. 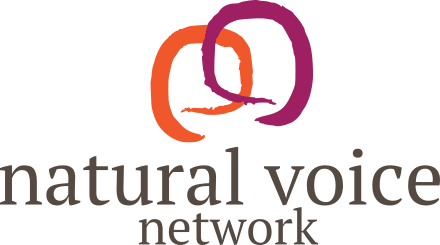 We have been a constituted group since 2000, and our working methods and philosophy emerged out of the pioneering work of Frankie Armstrong, who began leading voice workshops in the early 1970s. You can read more about our history on the How The NVN Was Born page. We believe that singing is everybody’s birthright. For thousands of years all over the world people have sung — to express joy, celebration and grief, to aid healing, to accompany work, devotion and the rituals of life — without worrying about having a “good” voice or “getting it right”. Singing has been a part of life, a way of binding communities. Each person’s voice is as unique as their fingerprint: the voice we are born with is capable of freely expressing a full range of emotions, thoughts and experience – this is what we mean by the “natural voice”. Creating an accepting community is an essential element of our approach: a community where singing together is a natural experience that is open and accessible to all. Many people see themselves as ‘non-singers’ because of previous experiences of criticism and judgment. Many are excluded from singing activities because they do not have music-reading skills or trained voices. Our work aims to counteract these experiences and give people confidence in their voices by providing them with a supportive learning environment and a suitable repertoire. Our workshops, choirs, courses and projects are accessible and inclusive. We aim to accommodate mixed levels of experience. We avoid technical language and musical jargon. We aim to teach songs in a traditional way – mostly by ear. We endorse the use of physical and vocal warm-ups to facilitate vocal health, confidence and fun. We see the voice and singing with others as a fundamental community building activity. We respect and acknowledge all sources and songwriters, and take care to set songs in their historical and cultural context.